Prophase I: Leptotene. The chromosomes become visible as long, thin single threads. The process of chromosome contraction continues in leptotene and throughout the entire prophase. 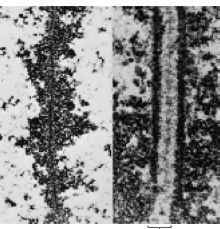 Small areas of thickening (chromomeres) develop along each chromosome, which give it the appearance of a necklace of beads. Prophase I: Zygotene. Active pairing of the threads makes it apparent that the chromosome complement of the meiocyte is in fact two complete chromosome sets. Thus, each chromosome has a pairing partner, and the two become progressively paired, or synapsed, side by side as if by a zipper. Prophase I: Pachytene. This stage is characterized by thick, fully synapsed chromosomes. Thus, the number of homologous pairs of chromosomes in the nucleus is equal to the number n. Nucleoli are often pronounced during pachytene. The beadlike chromomeres align precisely in the paired homologs, producing a distinctive pattern for each pair. Prophase I: Diplotene. Although each homolog appeared to be a single thread in leptotene, the DNA had already replicated during the premeiotic S phase. This fact becomes manifest in diplotene as a longitudinal doubleness of each paired homolog. Hence, because each member of a homologous pair produces two sister chromatids, the synapsed structure now consists of a bundle of four homologous chromatids. At diplotene, the pairing between homologs becomes less tight; in fact, they appear to repel each other, and, as they separate slightly, cross-shaped structures called chiasmata (singular, chiasma) appear between nonsister chromatids. Each chromosome pair generally has one or more chiasmata. Prophase I. Diakinesis. 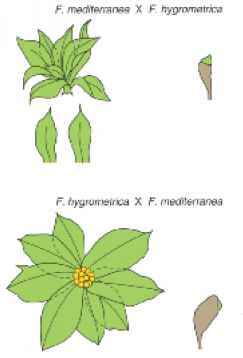 This stage differs only slightly from diplotene, except for further chromosome contraction. By the end of diakinesis, the long, filamentous chromosome threads of interphase have been replaced by compact units that are far more maneuverable in the movements of the meiotic division. Metaphase I. The nuclear membrane and nucleoli have disappeared by metaphase I, and each pair of homologs takes up a position in the equatorial plane. At this stage of meiosis, the centromeres do not divide; this lack of division is a major difference from mitosis. The two centromeres of a homologous chromosome pair attach to spindle fibers from opposite poles. Anaphase I. Anaphase begins when chromosomes move directionally to the poles. The members of a homologous pair move to opposite poles. Telophase I. Telophase and the ensuing interphase, called interkinesis, are not universal. In many organisms, these stages do not exist, no nuclear membrane re-forms, and the cells proceed directly to meiosis II. In other organisms, telophase I and the interkinesis are brief in duration; the chromosomes elongate and become diffuse, and the nuclear membrane re-forms. In any case, there is never DNA synthesis at this time, and the genetic state of the chromosomes does not change. Prophase II. The presence of the haploid number of chromosomes in the contracted state characterizes prophase II. 12 Metaphase II Metaphase II. The chromosomes arrange themselves on the equatorial plane in metaphase II. Here the chromatids often partly dissociate from each other instead of being closely appressed as they are in mitosis. Anaphase II. Centromeres split and sister chromatids are pulled to opposite poles by the spindle fibers. Telophase II. 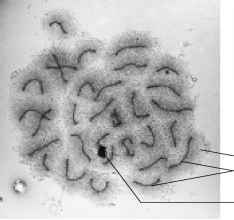 The nuclei re-form around the chromosomes at the poles. In the anthers of a flower, the four products of meiosis develop into pollen grains. In other organisms, differentiation produces other kinds of structures from the products of meiosis, such as sperm cells in animals. 1. Prophase I: As in mitosis, the sister chromatids become visible, closely adhered side by side. However, in contrast with mitosis, the sister chromatids (although fully replicated at the DNA level) show an apparently undivided centromere. The sister chromatid pairs at this stage are called dyads, from the Greek word for "two." 2. Metaphase I: The homologous dyads now pair to form structures called bivalents. Thus, any one bivalent contains a total of four chromatids, sometimes referred to as a tetrad (Greek; four).This stage represents the most obvious difference from mitosis. Pairing of the dyads to form a bivalent is accomplished by molecular assemblages called synaptonemal complexes along the middle of the tetrads (Figure 3-30). Although the existence of synaptonemal complexes has been known for some time, the precise working of these structures is still a topic of research. Nonsister chromatids of the tetrad engage in a breakage-and-reunion process called crossing over, to be discussed in detail in Chapter 4. The crossover is visible as two chromatids crossing each other to form a structure called a chiasma (plural, chiasmata). For those species that have been carefully studied, a minimum of one crossover per tetrad is known to be a necessary prelude to subsequent orderly chromosome separation. 3. Anaphase I: Each of the two pairs of sister chromatids (dyads) is pulled to a different pole. 4. Telophase I: A nucleus forms at each pole. 5. Prophase II: The dyads reappear. 6. Metaphase II: The dyads move to the equatorial plane. 7. Anaphase II: Each of the sister chromatids of a dyad is pulled into a different daughter nucleus as the cells divide for a second time. We see therefore that the fundamental events of meiosis are DNA replication and sister chromatid adhesion, followed by homologous pairing, segregation, and then another segregation. Hence, within a single cell, the number of copies of a chromosome of the same type goes from 2 : 4 : 2 : 1, and each product of meiosis must therefore contain one chromosome of each type, half the number of the original meiocyte. MESSAGE In mitosis, each chromosome replicates to form sister chromatids, which segregate into the daughter cells. In meiosis, each chromosome replicates to form sister chromatids. Homologous chromosomes physically pair and segregate at the first division. Sister chromatids segregate at the second division.